On Thursday, April 17, Tybee Island City Council voted unanimously to accept a plan addressing risks that the island faces from sea level rise over the next 50 years. As a low-lying barrier island, Tybee Island is already vulnerable to frequent and widespread flooding. The beach community has experienced 10 inches of sea-level rise since 1935, according to a nearby National Oceanographic and Atmospheric Administration (NOAA) tide gauge at Fort Pulaski. Three of the top ten highest tides ever recorded by the tide gauge occurred in October 2015. Scientists worldwide expect this trend to accelerate in the future. A major tourism hub of the Georgia coast, Tybee Island is a significant driver of the state’s coastal economy and the nearby city of Savannah. Whether through more frequent and widespread flooding or devastating destruction due to intensified storm surges, sea-level rise has the potential to dramatically affect the island’s economic, infrastructural and environmental health. A report drafted by faculty and staff at Stetson University, Georgia Sea Grant and UGA Marine Extension recommends plans to modernize and replace portions of US Highway 80, the only road on and off the island. 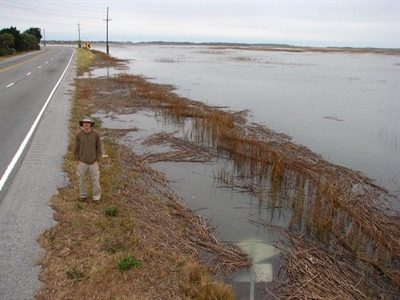 In 2015, the highway experienced approximately 23 tidal flooding events (significantly more than in any year in the tide gauge’s history). Those events cut it off from the mainland, proving to not only be a safety and evacuation concern, but an economic one, as well. o Elevating city well houses. If these well houses flood, drinking water and waste disposal could be limited or unavailable. o Tidal backup of storm water drainage systems in low-lying areas of Tybee Island, resulting in periodic saltwater flooding of neighborhood roads and yards. o Increased coastal erosion, particularly on Tybee Island’s Atlantic beaches. During the planning process, more than 4,000 people were reached through outreach and public town hall meetings, helping to raise awareness of the city's vulnerabilities and set planning priorities. This research has also resulted in tangible savings. The Tybee Island Sea Level Rise Adaptation Plan directly impacted the economy of Tybee Island by helping to improve the City’s rating under FEMA’s Community Rating System (CRS). During the planning process, Tybee Island went from a class 7 to 5 in CRS, enabling savings in flood insurance of $3 million for property owners on the island. Funded by the NOAA’s National Sea Grant College Program , the City of Tybee Island Sea Level Rise Adaptation Plan has emerged as a model for other coastal communities across the country. The planning project received NOAA Sea Grant’s highest national outreach award and was featured as a case study in the federal government’s U.S. Climate Resilience Toolkit. Strategies developed in Tybee Island are being implemented in St. Marys, Georgia; Hyde County, North Carolina; the City of Islamorada, Florida and Monroe County, Florida. To read the full Tybee Island Sea Level Rise Adaptation Plan, visit https://www.researchgate.net/publication/289999590_Tybee_Island_Sea-Level_Rise_Adaptation_Plan.